The Finnlo weight bench is a flexible weight bench for dumbbell and barbell training. 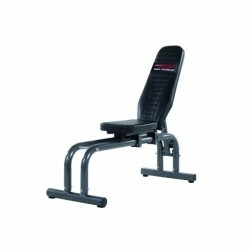 The incline bench is very loadable and offers a flexible use thanks to its adjustability. 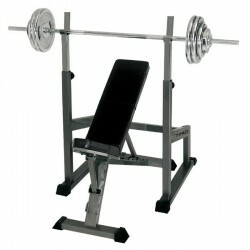 Finnlo weight benches are ideal for training with free weights like dumbbells and barbells. 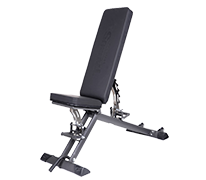 Finnlo weight benches are extended by a barbell unit, so that exercises like barbell training, i.e., bench press, are done more comfortably and more effectively. Thanks to a high maximum user weight, Finnlo weight benches are sturdy and can even be used for weight training with heavy training weights. Easy adjustment mechanisms facilitate the adjustment of the Finnlo weight bench and make it possible to do usual strength training exercises. The design of a Finnlo weight bench is quiet and of dark upholstery colour and grey varnishing of the frame. The construction of Finnlo weight benches is practical and offers good training possibilities. Purchase at an affordable price a Finnlo weight bench in a set with appropriate accessory and save money. You get all you need in a set for starting weight training.